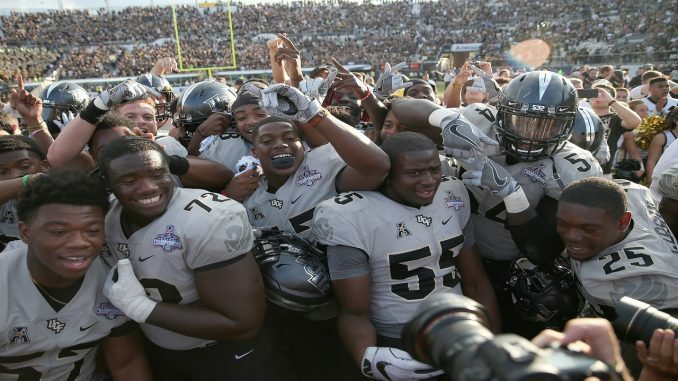 Less than 24 hours after winning the American Athletic Conference Championship, UCF has claimed the No. 12 rank in the College Football Playoff rankings. The Knights (12-0, 8-0 AAC) defeated No. 20 Memphis (10-2, 7-1 AAC) 62-55 in double overtime on Saturday afternoon, giving UCF its third AAC championship title. Sophomore quarterback McKenzie Milton was voted Most Outstanding Player for the conference championship game, throwing for 494 yards and five touchdowns. He threw three interceptions and rushed for 68 yards and a touchdown. With former coach Scott Frost out at UCF and in at his alma mater as the 30th head coach in Nebraska history, the Knights landed at No. 10 in Sunday’s AP Top 25 poll and in the Coaches Poll. The ranking tied for UCF’s highest spot in an AP Top 25 poll. With UCF’s CFB Playoff ranking, they are speculated to play in the Chick-fil-A Peach Bowl on New Years Day. After falling to UCF, Memphis stayed at No. 20 in the CFB Playoff rankings. UCF also is now the only undefeated FBS team in the country after No. 6 Wisconsin (12-1, 8-0) lost to No. 5 Ohio State in the Big Ten championship game Saturday night.